In light grey over dark grey with a beautiful original pale grey interior. 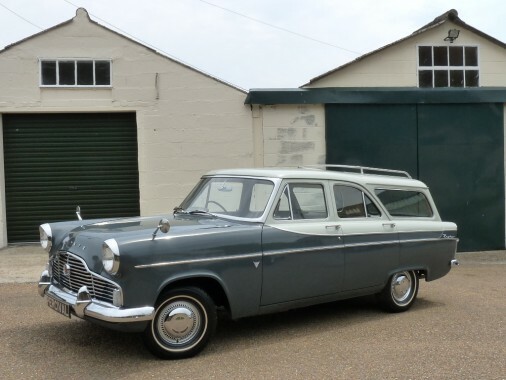 This rare and interesting Zephyr Estate has been owned by the last enthusiast for over thirty years. Sixteen years ago he commissioned a full bodywork restoration and an engine refresh by John and Brian at Classic Car Services near Maidstone who have restored many Mk11s. There is a photographic record of this. The car remains in beautiful condition inside and out. It is fitted with a 2.6 litre, six cylinder engine mated to a three speed manual gearbox with an overdrive. It has a detailed engine, a redio cassette player, new chrome and it retains its original registration number. A very rare and usable Ford which would look lovely criusing through the countryside or parked at Goodwood.